Marking the 20th anniversary of the original X1 machine, Illy has created the X1 Anniversary IperEspresso edition. This gorgeous capsule coffee machine is true to its heritage. Producing (arguably) the best capsule coffee on the market. It’s also really simple to use, with clever features like one-touch brewing. The high-price tag suggests it’s a machine Illy has aimed for those who truly appreciate fine coffee… and don’t mind paying for it. To find out more, read our full Illy X1 Anniversary IperEspresso review. See also: The 14 Best Coffee Machines. Some rival capsule coffee machines that are priced around the £500 mark come with crazy features. Wifi ready, fully self-cleaning, personal taste presets. The list goes on. Things are different here. Illy focuses on style and build quality. This is a straightforward device. Which makes it really easy to use too. Always a good thing! Put your favourite Illy iperEspresso pod into the portafilter-like handle and choose either a short or long pour. Want to steam some milk? That’s as easy as flicking another switch. When steaming the milk, the thermometer dial will start to move (almost immediately) towards the steam icon. Once it reaches the desired temperature, the machine will let you know. From here, all you need to do is place the steam wand into the milk for around 25-30 seconds. Practice does make perfect here. But stick with it. Once you’ve masted this skill you will have the ability to make every any kind of milk-based coffee. 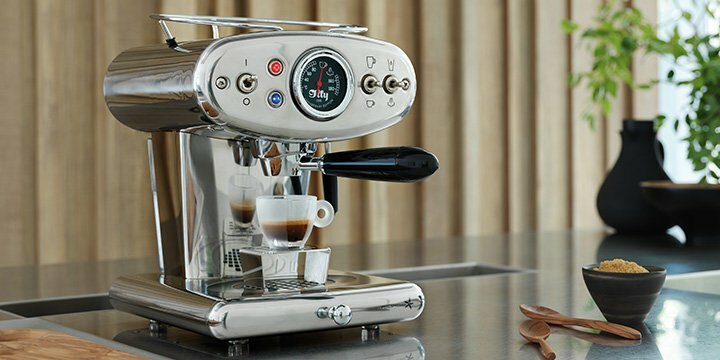 As with most coffee capsule machines, making an espresso with Illy X1 Anniversary edition is really easy. Fill the reservoir with water, insert a capsule and press a button. Once the coffee is poured, remove the capsule, wipe the steaming wand, and you’re done. This machine is also equipped with an automatic descaling system. This is a vital feature. Saving time on keeping the machine clean. Any machine that demands too much maintenance soon becomes a hassle. And you’ll end up not using it. Check out our review of the Jura E6: Another AMAZING high-end coffee machine! The design of the Illy X1 Anniversary IperEspresso machine is classy. The trademark smooth-carving lines and retro aesthetics have stood the test of time. Making it a standout feature of any kitchen. Available in chrome, black and red. With dimensions of 26cm x 25cm x33cm it can fit on any bench top. However, be aware that the large 1L water tank, that can make up to 10 coffees, pulls out directly backwards. So the unit won’t be able to sit flush against a wall. Unless you don’t mind moving it to fill with water. The Illy X1 Anniversary IperEspresso machine is designed to let you use your favourite coffee mug. This is because the drip tray actually slides out (easily) from within the unit. There’s a small cup stand too, so all cup sizes can fit neatly under the spout. How does the coffee taste? It can’t be beaten! The Illy X1 Anniversary IperEspresso machine comes equipped with the new iperEspresso capsule system. This uses a two-stage brewing process that produces intense, aromatic coffee. Note: The Illy X1 Anniversary IperEspresso machine can only use Illy capsules. For another beautifully-designed coffee machine, take a look at our KitchenAid Nespresso Artisan review. …and looks good while doing it. Read next: Not sure if you want a capsule coffee machine? See our roundup of the BEST Bean-to-cup Coffee Machines of 2018.